Dezeen promotion: British set designer Es Devlin has erected a solar-powered pavilion, containing films made at 12 locations in Cape Town, to show people the potential of electric mobility. Commissioned by Mercedes-Benz South Africa and managed by Design Indaba, Devlin created the public Zoetrope pavilion as an example of how future electric car charging stations may appear. The pavilion contains an interactive installation that aims to offer a glimpse into the impact that electric travel could have on our environment and behaviour in the future. 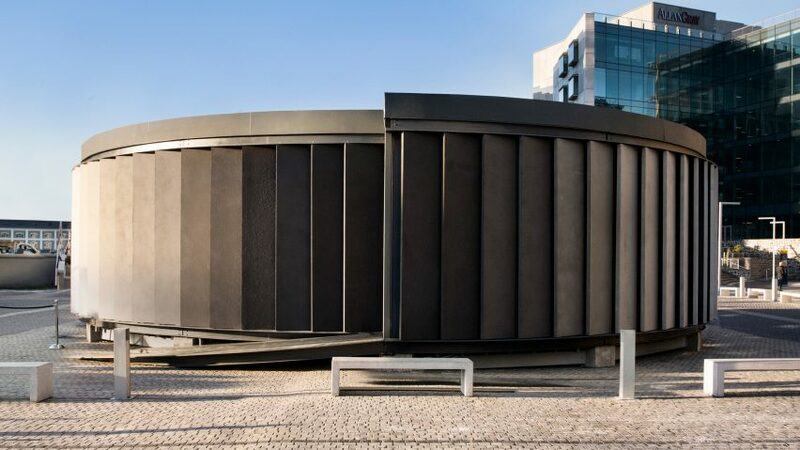 Located on Silo Square alongside Thomas Heatherwick-designed the Zeitz MOCAA art gallery, the Zoetrope pavilion was designed by Devlin, a speaker at last year’s Design Indaba. This year's edition of Design Indaba, which will be taking place from 27 February to 1 March. It uses solar power and Mercedes-Benz's branded electric intelligence (EQ) technology to visualise a future global network of solar-powered structures, specific to their locations, which would act as interactive charging stations for electric vehicle drivers. "Rapid advances in lithium battery technology are extending the periods of travel and diminishing the durations of charging stops at an exponential rate," said Devlin. "How should we approach the network of electric vehicle charging stations that is set to emerge all over the globe? How should we spend our time while we wait for our electric vehicles to recharge mid journey?," she questioned. To design the structure, Devlin took a map of Cape Town and chose 12 points that express the geographic and demographic range of life within a 62 mile (100 kilometre) radius of the site, including an underwater kelp forest and a football stadium. The designer gathered footage from each of these locations, which was then edited into 12 one-minute films to form the narrative that can be seen playing inside the Zoetrope pavilion. The pavilion is comprised of a steel frame structure clad in 72 concrete panels that were made using sand sourced from the 12 filming locations, and the same cement used to construct the original Silo building next door. "The structure merges with its historic surroundings through its very DNA, as well as the geographic imagery experienced once you enter the installation," said the organisers. Solar panels cover the pavilion roof, producing 11.4 kilowatts of energy that powers the audiovisual equipment used inside. Inside, visitors are led through a "labyrinthine" path that spans the length of the 12 one-minute films, which aim to educate viewers about their surroundings as well as the relationship between solar energy, location and electric mobility. "Our landscapes bear the traces of every successive historic transport system overlaid: each new mode of human connection imprints its geometry onto our planet's geography," explained Devlin. "First it was paths traced by human feet, the location of resting places determined by levels of human endurance; then tracks from cart wheels and a network of coaching inns with stables, their frequency determined by the metabolism of a horse." "Next the size of gas tanks in fossil-fuel driven cars determined the geometry of the global highway petrol station network," she continued. Mercedes-Benz South Africa approached Design Indaba founder Ravi Naidoo back in March 2018 with the proposal of a pavilion that could interpret the theme of electric mobility. Completed seven months later in November, the pavilion will remain open to all visitors for a year. "The automotive industry is currently undergoing a transformation that offers great opportunities to shape the future in lasting ways through innovation, inspiration and fascination," said Mercedes-Benz South Africa CEO Johannes Fritz. "Mercedes-Benz is proud to have commissioned an artwork that embodies emotion and intelligence while considering the future of mobility and introducing South Africa to our (Electric Intelligence) EQ n technologies," he added. London-based Devlin also recently designed the UK Pavilion for the Dubai Expo 2020, which featured an illuminated "message to space" made up of numerous AI-generated poems, which the Expo's anticipated 25 million visitors will be invited to contribute to. Design Indaba takes place from 27 February to 1 March in Cape Town, find out more about the event on its website.